An only child growing up in remote northwest China, National Renewable Energy Laboratory (NREL) researcher Chunmei Ban seemed destined to be a doctor—both of her parents worked in a hospital. But their experience of long hours and grueling cases soured her on the profession. Instead, she said "I wanted to be a scientist, although I didn't know what scientists do. I just thought it was a good career. In my mind, it was about learning and the discovery of so many things." An excellent student, she gained admission to Tianjin University, where she earned both her bachelor's and master's degrees in electrochemistry. After graduation, although unsure of what she planned to do, she was certain of one thing: a visit to come to the United States. "I wanted to learn a lot of science and technology. The USA was my first choice, and the best opportunity because it is so open." So, after working for a year, she landed at the State University of New York at Binghamton in upstate New York in 2004. Her adviser turned out to be a distinguished Englishman named Stanley Whittingham. It is hard to overstate Whittingham's impact on lithium-ion battery research—he is often called the "founding father" of the rechargeable lithium-ion (Li-ion) battery. "He inspired me," Ban said. Still, at that time, these batteries were in the shadow of fuel cells, and funding was tight. "I was worried about not having enough funding," she said, so she hurried to finish her Ph.D. dissertation in chemistry. In 2008, there was an opportunity at NREL. "That was a turning point," Ban said. "The lithium battery was considered alternative power for the car. Funding sources changed." Whittingham's mentoring and legacy is one that has influenced how Ban supports others in the field. Her manager in the Chemistry and Nanoscience Center, Nate Neale, said "Ban's passion for the philosophy of science and technology is a gift that she bestows on her numerous mentees. She has served as a mentor for more than 15 students and postdocs dating back to 2010, all of whom benefit from her lessons in both science and life during their time with her." The focus of Ban's work during the next decade spanned a variety of interests—electrochemical energy storage systems, which included Li-ion batteries, lithium-air batteries, organic radical batteries, and magnesium-ion batteries. And the lessons she learned about American culture paid off. She learned, she said, that "if you want to collaborate, just let people know." Her approach has produced a steady stream of innovation. Recently, she was a corresponding author of the Nature Chemistry paper "An Artificial Interphase Enables Reversible Magnesium Chemistry in Carbonate Electrolytes." She and her co-authors explained how they pioneered a method to enable the reversible chemistry of magnesium metal in the noncorrosive carbonate-based electrolytes and tested the concept in a prototype cell. The technology possesses potential advantages over lithium-ion batteries—notably, higher energy density, greater stability, and lower cost. "Being scientists, we're always thinking: What's next?" said Ban. 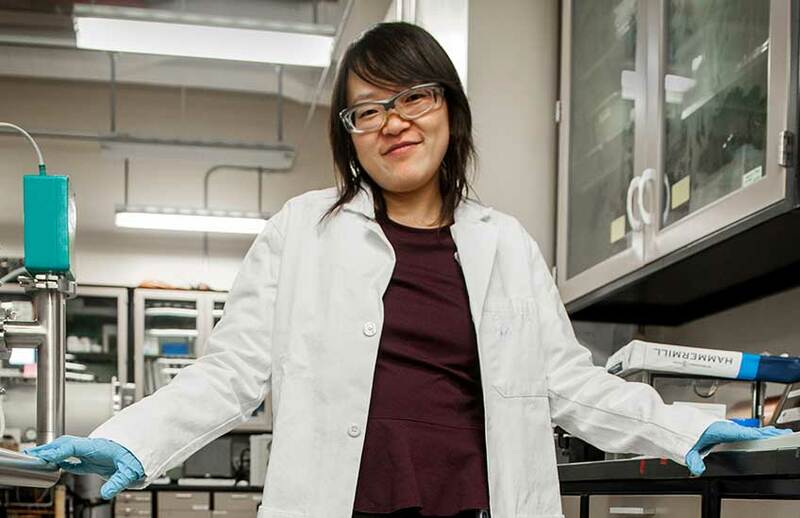 And, in 2011, she and her NREL partners developed a groundbreaking manufacturing process that uses a special kind of carbon nanotube to increase the volume of active material that can be stored within an electrode. The idea was to produce a higher-performance, safer, lighter-weight lithium-ion battery that can be produced at a lower cost. Ban is in a unique position: the daughter of conservative Chinese parents—and the mother of a 4-year-old girl who is rapidly learning English. She and her husband, who works in grid research, both support grandparents back in China. Bringing her relatives here can prove difficult. "My mom can't speak English. And she couldn't drive," she said. When her mother flew over here for the first time, Ban excitedly drove her to her family's house in Genesee. "See all the wild animals, pine trees, and open space," she told her mother—but her guest wasn't impressed. "There are no people, and we can't get around." Used to challenges to overcome, Ban sees a solution. "Unmanned cars could help a lot. People who don't drive, like my mom, could still get around and find more things," she said. This aspiration also ties into her research. Batteries for electric vehicles could further this and other goals. "I want my efforts to contribute to electric vehicles, so my parents and older friends can drive cars in the future. That is my goal." Additionally, Ban wants to see a future with no accidents, because she was the victim of a car crash in 2016 when a new driver lost control of her car. "Logical systems could provide greater safety—and take away human emotion," she said. The impact of having her own child has been profound—and has spurred her to the next level of understanding English, as well as American culture. "I didn't realize that desire before I had her," Ban said. "Sometimes, the words coming from her mouth are so beautiful." She's enjoyed learning children's songs. One of their favorites is an old standard, "Daisy Bell (Bicycle Built for Two)." The chorus to this popular song is familiar to many: "Daisy, Daisy / Give me your answer, do. / I'm half-crazy / all for the love of you," ending with the words, "a bicycle built for two." "Just a bicycle for two can make life so wonderful," she said. "I feel that is how I learn the language, those rhymes." Overall, her continuing improvement in expression is helping her at NREL. "When I write, I want this to be something people can read. I don't want to write only for someone with scientific purposes. When they read this, I want them to find it very interesting." This is something she's discovered. "When I find some old paper—from the 1940s and 1950s—I realize the scientists were funny and had a sense of humor. I want my work to be like theirs. When you read my paper, I want you to laugh—but also find it very meaningful. That's the goal I'm working on." On a deeper level, she said that "science and technology are also philosophy. Some might find working just in science and technology for years would be a little boring. But I treat this as philosophy here and in my life." She's trying to convey this new understanding to her postdoctoral researchers. "I want you to be successful and for us to be successful together. When we finish a paper, we feel proud of this. I feel—Please read this: This is a story you want to hear." Her journey isn't over. "I'm still learning," she said. Maybe she'll attain her lofty goals. Maybe not. But she's determined to make a difference. "I don't want people to think technology is not interesting. We may not party, but we are involved in experiments and generate new things. This is really fun." She's learned to understand much—and she wants others to do so, too. "I hope more people will be involved in chemistry. When you just learn chemistry from the book, it's boring—but when you think about it, the world is made of elements, products of chemical reactions. Everything's involved with chemistry." Ban sees a world where blue skies are preserved, the mountains remain unchanged, and the earth provides stability for mental health. It's all in her journey, a trip begun near the old Silk Road and continuing in Colorado. "I want to write a book about batteries, and I've already contacted a publisher," she said. Despite any language barriers, don't expect Ban to stop. "Compared with the universe, we have a short life. I want some people to remember me—and say that she did something." Eagerly, she continues to learn. "A lot of the scientific literature really inspired me. I remember the authors' names." For Ban, her vision comes down to philosophy. "What's life? I don't want to leave a bad footprint. I want to contribute to knowledge. The next generation can make this world better—and see the blue sky and play outside."